Couple photo session in an easy and casual way. You’re in one of the most romantic city so enjoy it and let professional photographer do her job! I’ll guide you thru and save you special lifetime moments in photographs. For real photography admires. To get the best light photo session divided in 2 parts - morning and evening. It is possible to do second part in another city or island Burano! It's fast and fancy. Sightseeing form the boat - beautiful way to see Venice, an alternative to gondola. Water taxi can fit up to 10 people. Perfect choice for a group of friends or big family. 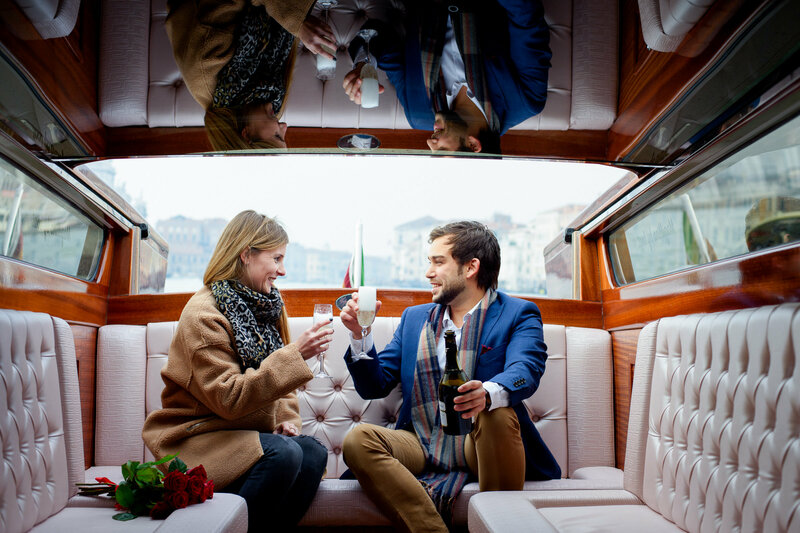 You want to propose your love in Venice? Make it special and memorable? I will help you to chose the best idea and organised every single step. From the flowers and place to romantic dinner! Do you work only in Venice? - No, I travel all around Italy and Europe. How to book a photographer in Venice ? - I will need the following contact details: Your full name, phone number, e-mail address, information about your hotel in Venice. Booking deposit is 30% of the total amount. It can be paid by PayPal and Stripe, or via bank transfer (within Europe). The remaining balance is to be paid by cash on the day of the photo session. What if I have to cancel booking? - Very sorry to hear that! Cancelation policy for love storys - is free up to 1 month before photosession. 1 week before you can turn your booking into gift certificate! - This varies by package and the productivity of the day’s shooting. I guarantee 35 photographs per 1 hour of shooting. - Yes. All the photographs that you get will be color/exposure adjusted and all the closeups will be retouched. When and how will we get our photographs? Post production takes 2 weeks, with delivery via Dropbox or Wetransfer. What if we are bad at posing? - Don’t worry! None of my couples are models, and for many of them it will be their first professional photo session. I prefer to do work in an easy and casual way. No stiff posing or fake emotions, relax! You’re in one of the most romantic cities in the world, so enjoy it and let your professional photographer do her job! I’ll guide you through and save special moments in photographs to enjoy for a lifetime. When is the best time for photo sessions in Venice? - On the narrow city streets a professional photographer in Venice will manage to take good pictures even at noon. However, for the best possible images, a perfect time for a photo shoot will be first 3 hours after sunrise and 3 hours before sunset. Soft light is best for open spaces like the San Marco area. Early morning is also my favorite time because it is less crowded. - If you want to take a gondola ride please let me know in advance. I will plan our route so we won't lose any time. Gondola tours cost cost 80 euros until 6 PM, and 100 euros after 6 PM for a 30 minute ride. You pay the gondolier directly. I can help you to book a gondola ride in advance. - Plan your outfit in advance. Couples should try to coordinate their outfits to look good together in the photos. 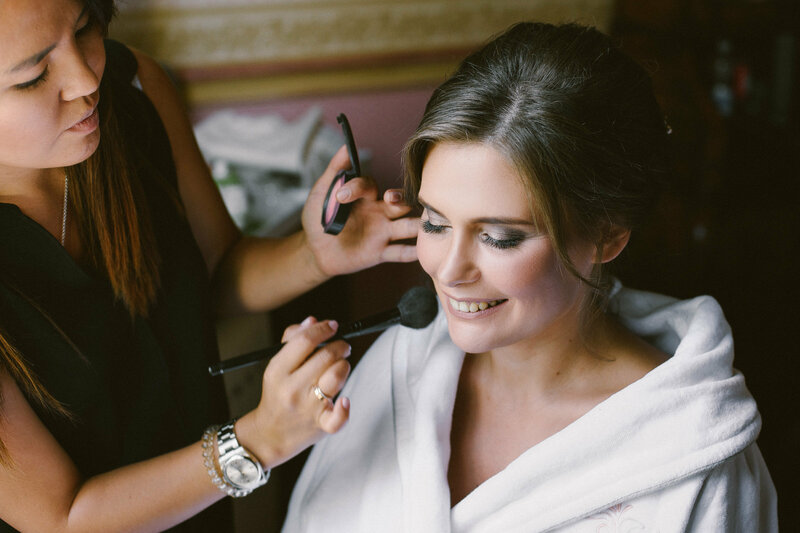 - Make sure that your dress is not only beautiful but also comfortable. Bring spare shoes. If you chose high heels for the shoot, please bear in mind we are going to walk a lot! - I would not recommend very short skirts/dresses for photographs on a gondola. - Get a good night’s sleep before early morning photo sessions, and take an afternoon break before an evening session. Everyone looks their best when they’re well rested. As a photographer in Venice, what would you recommend in case of rain? - Weather in Venice is unpredictable. Don't trust weather forecasts one week ahead. If it's 100% probability of rain the next day, we can always change time or even the date of the photoshoot. If rain starts during the photo session we will take a break and wait. I know 3-4 locations in Venice where we can photograph indoors, and i know tricks how to make beautiful photographs with umbrellas!